A stand of ancient Redwood trees in Humboldt Redwoods State Park, California, USA. Gentle giants - Redwood trees are also known as Sequoia and are native species to the Southern West Coast of California. One of the largest stands of Redwood trees is in Humboldt Redwoods State Park. Within the Humboldt Redwoods State Park the trees are protected from being harvested for lumber. 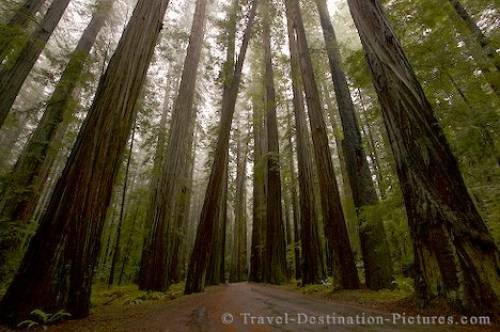 Some trees have been left to grow to over 90 metres and Humboldt Redwoods State Park also boasts the largest Coastal Redwood called the Stratosphere Giant which measured 112.83 metres as of 2004.
the Humboldt Redwoods State Park, California, USA.